What monsters populate your Terror Within the Mind? The other evening, just before sunset, I was walking down our street to meet my spouse, Kip, for dinner at a neighborhood restaurant. Coming towards me on the sidewalk was a man dressed in a black and white striped prison uniform cradling a large mallet with both hands. His face was painted white, fake blood dripped from the corners of his mouth. The first thought that crossed my mind was how bizarre this would seem to someone from another culture who had no context for this scenario. As for us, we’re used to ghosts and ghouls wandering our neighborhood this time of year. We live near a historic prison, now a museum, and every fall as a fundraiser the Friends of Eastern State Penitentiary put on a haunted house inside the prison’s massive stone walls that loom like a fortress in the heart of our neighborhood. They hire actors to play the parts of gruesome prison guards, blood-thirsty convicts, and all manner of haunted and haunting characters. People flock to Terror Behind the Walls from all over the region, many arriving on the Ghost Bus that shuttles them back and forth from outlying parking areas. As Halloween draws nearer they often stand in line for hours, their anticipation mounting as they get closer and closer to the smoke-breathing gargoyles lurking above the gateway to the prison. It’s not really my cup of tea. On the whole I don’t seek out situations that cause my palms to sweat and my heart to race; I don’t care for roller coasters, I always close my eyes during the scary, gory scenes in a movie, and I’ve never visited Terror Behind the Walls. But I’ve toured Eastern State Penitentiary on other occasions, in the daylight, and I can imagine what an effective setting it would provide for a haunted house. In truth, I think most of us don’t need to go anywhere to get the same sort of terrifying thrill, because, being the imaginative creatures that we are, we have a haunted house in our mind that we can visit any time we want to without having to buy a ticket or wait in line. The haunted house of the mind isn’t made up of stone walls and freelance actors, of course. It’s the creative genius of our own thoughts. We are perfectly capable of concocting all sorts of terrifying scenarios populated with monsters and ghouls screaming blood-curdling descriptions of our immanent destruction. 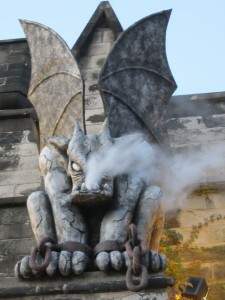 The difference between literal haunted houses like the one in our neighborhood and the internal one — let’s call it Terror Within the Mind — is that when someone passes beneath the gargoyles at the entrance of Eastern State Penitentiary they know they’re entering a make believe world. Unfortunately, we rarely carry the same awareness with us when we enter Terror Within the Mind. We buy into the fake blood and plastic guillotines. We forget that the scenario of fear playing itself out is nothing more than our mind’s illusion, a make believe world. I suppose a visit to a haunted house like Terror Behind the Walls might actually be a good way to rehearse our visits to Terror Within the Mind. It might teach us to recognize the imaginary ghouls for what they are: convincing actors playing a role extraordinarily well. We might learn to take it all with a sense of humor, seeing it simply as fun entertainment. We might even start applauding the ghouls for their acting abilities, shouting “Bravo” every time they deliver a particularly terrifying line, hurling bouquets of roses at their feet and insisting that they take a bow and do an encore. That evening, walking to the restaurant in the twilight, the ghoulish, mallet-toting convict and I finally reached each other. As we passed each other on the sidewalk I caught his eye and smiled at him. He smiled back, his grin spreading across his chalky painted face, and the two of us shared that momentary bonding that is only experienced by people who recognize they’re both in on the joke.